Visual and audio events tend to occur together: a musician plucking guitar strings and the resulting melody; a wine glass shattering and the accompanying crash; the roar of a motorcycle as it accelerates. These visual and audio stimuli are concurrent because they share a common cause. Understanding the relationship between visual events and their associated sounds is a fundamental way that we make sense of the world around us. the object making the sound can be localised. Learning from multiple modalities is not new; historically, researchers have largely focused on image-text or audio-vision pairings. However, a common approach has been to train a “student” network in one modality using the automatic supervision provided by a “teacher” network in the other modality (“teacher-student supervision”), where the “teacher” has been trained using a large number of human annotations. 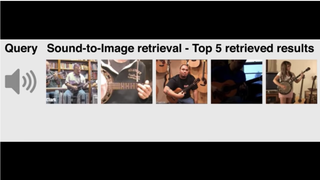 For instance, a vision network trained on ImageNet can be used to annotate frames of a YouTube video as “acoustic guitar”, which provides training data to the “student” audio network for learning what an “acoustic guitar” sounds like. In contrast, we train both visual and audio networks from scratch, where the concept of the “acoustic guitar” naturally emerges in both modalities. Somewhat surprisingly, this approach achieves superior audio classification compared to teacher-student supervision. As described below, this also equips us to localise the object making the sound, which was not possible with previous approaches. Our core idea is to use a valuable source of information contained in the video itself: the correspondence between visual and audio streams available by virtue of them appearing together at the same time in the same video. By seeing and hearing many examples of a person playing a violin and examples of a dog barking, and rarely or never seeing a violin being played while hearing a dog bark and vice versa, it should be possible to conclude what a violin and a dog look and sound like. This approach is, in part, motivated by the way an infant might learn about the world as their visual and audio capabilities develop. We apply learning by audio-visual correspondence (AVC), a simple binary classification task: given an example video frame and a short audio clip, decide whether they correspond to each other or not. The image and the audio subnetworks extract visual and audio embeddings and the correspondence score is computed as a function of the distance between the two embeddings. If the embeddings are similar, the (image, audio) are deemed to correspond. 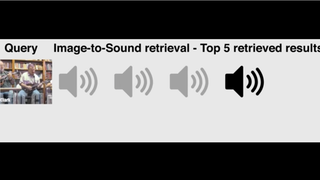 play Image-to-audio retrieval: "Which sounds fits this image?" 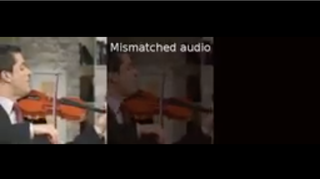 play Audio-to-image retrieval: "Which image fits this sound?" The AVE-Net recognises semantic concepts in the audio and visual domains, but it cannot answer the question, “Where is the object that is making the sound?” We again make use of the AVC task and show that it is possible to learn to localise sounding objects, while still not using any labels whatsoever. play What is making the sound? 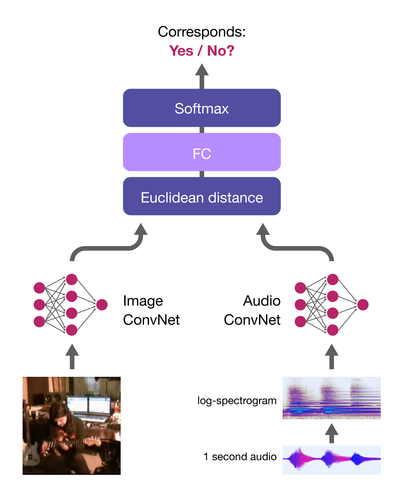 The unsupervised audio-visual correspondence task enables, with appropriate network design, two entirely new functionalities to be learnt: cross-modal retrieval, and semantic-based localisation of objects that sound. Furthermore, it facilitates learning of powerful features, setting the new state-of-the-art on two sound classification benchmarks. These techniques may prove useful in reinforcement learning, enabling agents to make use of large amounts of unlabelled sensory information. Our work may also have implications for other multimodal problems beyond audio-visual tasks in the future. This work was done by Relja Arandjelović and Andrew Zisserman. Graphics by Adam Cain and Damien Boudot.